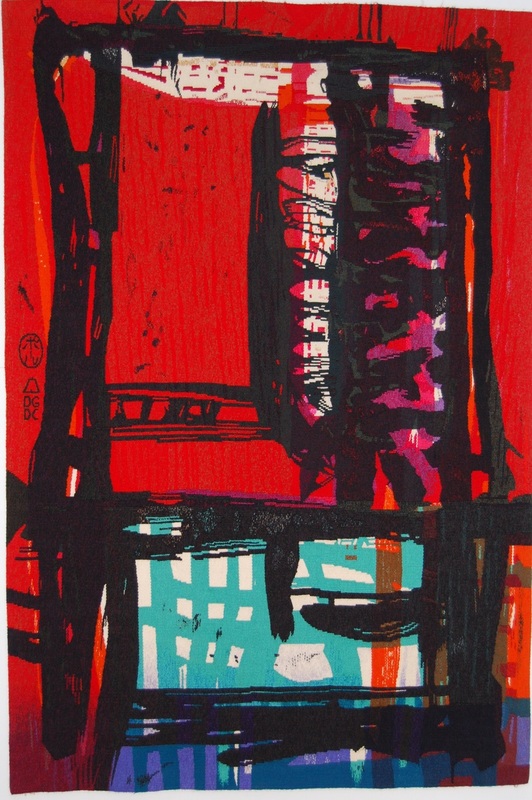 Scottish artist Paul Furneaux was approached by Dovecot Studios after having been awarded the Alastair Salvesen Travelling Award in 1999, which allowed him to travel to Japan and train in local printmaking techniques, focusing on woodblock printing. Three versions of the same print were selected for the collaboration with the studios, and Master Weavers Douglas Grierson and David Cochrane worked with all three to create the finished tapestry in 2003, which bears aspects of each one of them. Furneaux has chosen to use a Japanese character for his signature, which can be seen above the weavers’ initials at the left hand side of the tapestry.